These terms and conditions of use govern your use of the Hungry Jack's® Pty Ltd App ("App") and your use of the App indicates your acceptance of these terms and conditions. Hungry Jack's may amend these terms and conditions, from time to time, by giving prior notice. Your continued use of the App, following any changes, represents your acceptance of those changes. While we endeavour to provide you with the most helpful and up-to-date information, which is current at the time of publishing, Hungry Jack's does not represent that the information contained on the App is up-to-date. Hungry Jack's accepts no liability to you or anyone else if errors occur in the information on the App at no fault of Hungry Jack's or if that information is not up to date. You should be aware that all products and prices advertised on the App are current at the time of publishing, are subject to availability and that pricing is subject to change without notice. If you do not agree with these terms and conditions, you should not use the App. You must create an account to access all the benefits of the App and to redeem rewards, gifts, prizes and other benefits, which may include food or beverage items, birthday presents, targeted vouchers, non-food items and other promotional offers. You will also be able to give feedback about your experience at our restaurants, pre-order meals, locate nearby restaurants and store meal preferences for future convenience. To use the App, you must download the App onto your smartphone. The App is only available on smartphones using an Android or iOS operating system. The App has limited functionality unless and until you create, and log into, an account. To set up an account, you must provide your name, email address and mobile phone number. There are further benefits if you provide your gender, date of birth and postcode - although these details do not have to be provided to create an account. The App is only available for use in Australia, and can only be downloaded by individuals who are 14 years or over using a device that operates on an iOS or Android operating system. If you are under the age of 18, you need your parent or guardian's consent to use the App. If you are under the age of 18, and you create an account or use the App, you represent that you are at least 14 years or older and your parent or guardian has consented to you using the App, and agrees to be bound by these terms of conditions on your behalf. Hungry Jack's reserves the right to decline your request to create an account, in any circumstances. Hungry Jack's is likely to decline an account where you have previously had your account terminated. Hungry Jack's also reserves the right to decline your request to use log-ins that are the same as or substantially similar to existing log-ins, or are offensive, obscene, abusive, defamatory, infringing or reasonably create a risk of infringing the intellectual property of third parties, are unlawful, or are otherwise inappropriate in any way. Hungry Jack's may at its discretion ask you to produce identification to confirm your details and eligibility to use the App, or when redeeming benefits or may request that you verify the granting of consent to use the App by a parent or guardian where applicable. If you choose not to provide identification or comply with such a request, we may at our discretion cancel your account or refuse to provide you with the benefits to which we would otherwise provide. The benefits, deals, rewards or vouchers offered to users of the App may be subject to their own terms and conditions, which will be stated at the time such offer is presented and will apply in addition to these terms and conditions. The benefits offered to users of the App that specifically relate to the Shake and Win game are subject to the following terms and conditions. (a) claimants must download the App onto their smartphone and enter the required Facebook or email account details. Facebook and email account details need only be entered once, upon first use of App. Claimants must allow the App to detect and transmit information as to their location. (b) claimants must open the App on their smartphone. Claimants must shake their smartphone as prompted, to generate an electronic voucher redeemable at any participating Hungry Jack's restaurant ("Voucher"). (c) to redeem the Voucher, and obtain the food item or discounted food item specified in the Voucher ("Item"), claimants must scan the barcode in the participating Hungry Jack's restaurant within the time specified on the Voucher. The App will only allow users to play once daily, and each time a user plays. However, each game gives the user the option of forfeiting the Voucher generated on the first shake, and then shaking again. The Voucher generated by the second shake is the final and only Voucher that the user will generate on that day. (d) the Voucher being redeemed. Employees (and their immediate families) of Hungry Jack's, participating retailers and agencies associated with the Shake and Win promotion are ineligible to claim. Vouchers may be generated until such time as Hungry Jack's terminates the Shake and Win promotion. Subject to these conditions, termination of the Shake and Win promotion will occur one (1) month after Hungry Jack's publishes a notice of termination on the App. Hungry Jack's reserves the right to verify the validity of claims and claimants and to disqualify any claimant who Hungry Jack's suspects has submitted a claim that is not in accordance with these conditions or who has tampered with the claims process, including through the use of fake applications or by hacking the App. Hungry Jack's reserves the right to terminate the account of, and prosecute, persons who have tampered with the entry/claims process. Failure by Hungry Jack's to enforce any of its rights at any stage does not constitute a waiver of those rights. Hungry Jack's decision is final and no correspondence will be entered into. If an Item is unavailable, Hungry Jack's may, in its discretion, substitute the Item with an alternative item to the equal value and/or specification, unless to do so would be prohibited by law and subject to any written directions from a regulatory authority. The Shake and Win promotion is a guaranteed offer and chance plays no part in the determination of a claimant. Once a Voucher has been redeemed, the corresponding Item specified in that Voucher will be automatically replaced in the Item pool with another corresponding Item in order to ensure that the corresponding Item is always available. Vouchers cannot be used in conjunction with each other, or any other offer (except Hungry Jack's Value Meals). If for any reason whatsoever beyond Hungry Jack's reasonable control, the Shake and Win promotion is not capable of being conducted as reasonably anticipated, Hungry Jack's reserves the right, in its sole discretion, unless to do so would be prohibited by law, to (a) disqualify any claimant; and/or (b) subject to any written directions from a regulatory authority, to cancel, suspend, modify, terminate or cancel the Shake and Win promotion. Unless expressly stated within these conditions regarding all Items, all other expenses become the responsibility of the claimant. Items are not exchangeable and are not redeemable for cash. Except where resulting from fraud or where the claimant is otherwise ineligible under these terms and conditions, all claims in excess of the advertised Item pool will be honoured. Printing and other quality control errors will not invalidate an otherwise valid claim. Nothing in these conditions limits, excludes or modifies or purports to limit, exclude or modify any statutory consumer guarantees or any implied condition or warranty the exclusion of statute or cause any part of these conditions of entry to be void (“Non-Excludable Guarantees”). Subject to the limitations in the preceding sentence, Hungry Jack's excludes from these conditions all conditions, warranties and terms implied by statute, general law or custom. Except for liability in relation to a Non Excludable Guarantee, Hungry Jack's (including its officers, employees and agents) excludes all liability whether arising in tort (including without limitation negligence), contract or otherwise, for any personal injury or any other loss or damage (including without limitation loss of opportunity or loss of profits); whether direct, indirect, special or consequential, arising in any way out of the Shake and Win promotion, including, without limitation, the following: (a) any technical difficulties or equipment malfunction (whether or not under Hungry Jack's control); (b) any theft, unauthorised access or third party interference; (c) any claim that is late, lost, altered, damaged or misdirected (whether or not after their receipt by Hungry Jack's ) due to any reason beyond Hungry Jack's reasonable control ; (d) any tax implications; (e) any variation in a successful claimant and/or (g) the Item or use of the Item. Apple Inc and Google are not sponsors of or in any way involved with any promotional activity associated with the Shake and Win promotion. If you provide your credit card details, the App will allow you to order a Hungry Jack's meal for pick up at a participating Hungry Jack's restaurant. You may select the participating Hungry Jack's restaurant from which you wish to order and pick up your meals, or you can rely on the "Select Your Nearest Restaurant" function within the App, which works by selecting your nearest restaurant based on the location of the smartphone you are using at the time. If for any reasons you require a particular restaurant to fulfil your order (for example, a restaurant with Halal certified products), please visit us in restaurant. The App also enables you to store your transaction history so that you can conveniently recall what was ordered previously, and to customise your favourite meal items. When you place an order, you purchase the meal items you have selected and you will be given a unique order code. Payment is required in full at the time of order by the methods shown on the App. If we cannot process your payment, we cannot fulfil your order. Hungry Jack's may provide promotional offers in certain restaurants. Some offers may not be available in all restaurants, may not be redeemable via the App, and may only be available for a limited time. Specific terms and conditions as applicable to a promotional offer will be stated at the time of offer, and will apply in addition to these terms and conditions. Promotional offers cannot be used in conjunction with any other offer. 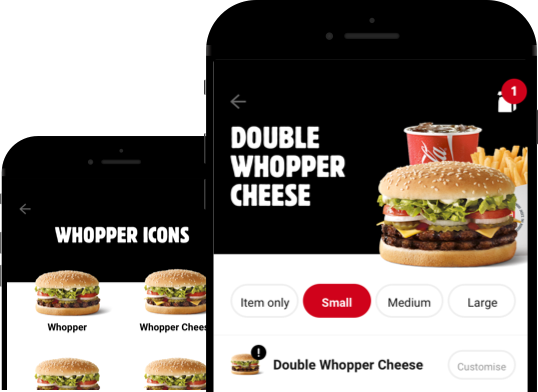 The menu contained in the App may be different from the full Hungry Jack's menu available in a participating Hungry Jack's restaurant. Please check the App menu carefully when placing your order. It is your responsibility to ensure that your food or beverage order is consistent with your dietary requirements including any intolerances or allergies. Where you pre-order a meal, but the participating Hungry Jack's restaurant indicates that it is not available, the participating Hungry Jack's restaurant will offer you a different meal of similar value as a replacement, or alternatively a full refund of the cost of the unavailable meal ordered, at your option. Otherwise, to the fullest extent permitted by law, the decision to give you a refund for a pre-ordered meal is at the discretion of Hungry Jack's. For clarity, where numerous meals are ordered together, Hungry Jack's will offer a refund in respect only of those meals that were unavailable, and not the entire order. Hungry Jack's will not offer a refund where you pay for an order but, at no fault of Hungry Jack's, fail to pick up the ordered food. If you provide your date of birth, Hungry Jack's will be able (but not required) to give you a birthday offer each year on or around your birthday. Hungry Jack's may run this promotional campaign, or decide to cease running this promotional campaign at its discretion. Where Hungry Jack's runs the promotional campaign, the offer is distributed to eligible account holders three days prior to their birthday. This offer cannot be used in conjunction with any other offer and will be subject to any further terms that are provided at the time the offer is distributed. You are only able to change or update your birthday once in your profile on the App or website. The App will continue to operate for as long as Hungry Jack's decides. You must keep your account details confidential and you are responsible for any activity on your account. You must immediately notify us of any unauthorised use of your account or password or any other security breach. It is your responsibility to delete your account when you no longer wish to use the App. You download, install, access and use the App at your own risk and cost, including internet service provider costs. All material and logos on the App remain the intellectual property of Hungry Jack's or its licensors. You must not use the App for unlawful purposes. You must not use the App for commercial purposes. You must not attempt to decompile, reverse engineer, disassemble or otherwise convert the App. We are not responsible for the content of any other websites, platforms or applications linked on the App. Your use of those products is governed by the 3rd-party providers' own terms and conditions. We reserve the right to monitor your account activity. We may terminate or suspend your account at our discretion. Hungry Jack's is likely to take this course of action if we see signs of fraud, abuse or suspicious activity, or any breach of these terms and conditions. If we believe you are using any automated software or other mechanical or electronic automated methods to receive benefits, or to take advantage of our promotions, we may suspend or terminate your account and refuse to honour any claims you make in respect of benefits and promotions. To the extent permitted by law, the App is provided on an "as is" and "as available" basis without any warranties of any kind either expressed or implied. To the extent permitted by law and not including any Non-Excludable Guarantees, we have no liability for any loss or claim that you may suffer or incur as a result of your use of the App. To obtain any compensation, you will need to provide documentary evidence of the loss or damage suffered, and documentary evidence that such loss or damage was a reasonably foreseeable consequence of our failure to comply with a consumer guarantee under the Australian Consumer Law. The type of remedy we will offer you may vary depending on how long it takes you to make a claim. These terms and conditions are governed by the laws of New South Wales, Australia, and you consent to the jurisdiction of the courts have jurisdiction in that state and courts of appeal from them. Pricing may vary between participating Hungry Jack's restaurants. Hungry Jack's® Pty Ltd can be contacted via our website www.hungryjacks.com.au, via telephone on 1300 852 326 and via email at hja.customerservice@hungryjacks.com.au.